FOR IMMEDIATE RELEASE: Portland, Maine (March 18, 2019) – Tom “The Phenom” Pagliarulo might be a man of mystery to many New England Fights enthusiasts, but the newcomer and his opponent at NEF 38: “Stormborn” require no introduction to one another. Maybe it’s a stretch to say Pagliarulo and Zac “Rocky” Richard lead parallel lives, but the similarities are striking. Each has a substantial, successful wrestling background. Both have accelerated from the finish line of their respective mixed martial arts careers, with one minor speed bump. And in a world where prospective combatants usually don’t have to work hard to drum up drama and animosity, Pagliarulo, 21, said that he and Richard are reasonably good, if casual, friends. 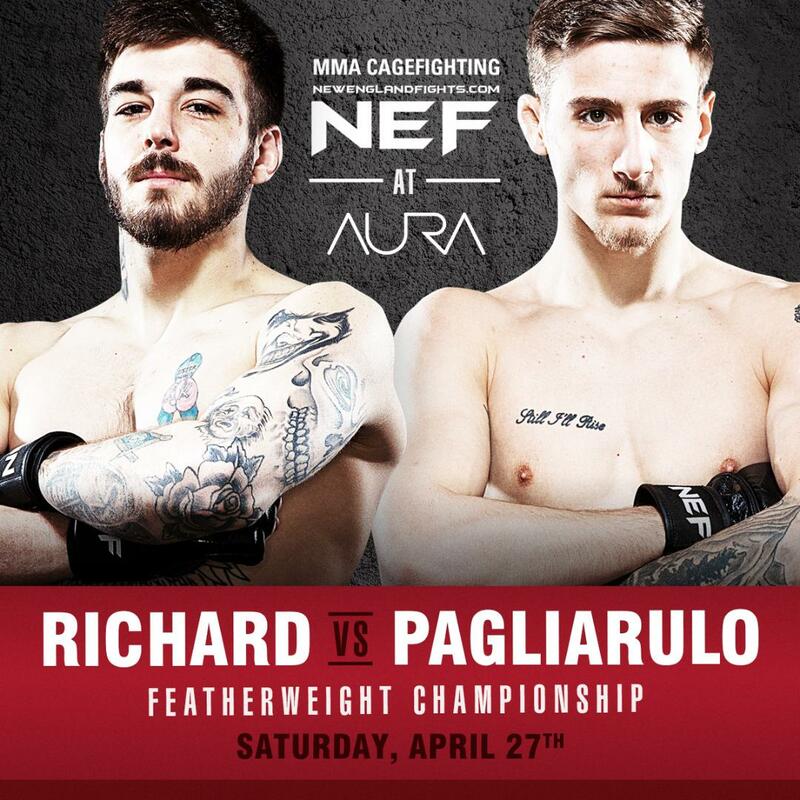 Pagliarulo (2-1) will be forced to put those common denominators on the back burner for one night – Saturday, April 27 – when he confronts Richard for the vacant NEF amateur featherweight title at Aura in Portland, Maine. The location is significant. Richard is a native of nearby Waterboro, and whether it’s that short 30-minute commute or a drive two-thirds of the way across the state to Bangor, his family and friends are fiercely loyal. A product of Haverhill, Massachusetts, who now trains across the New Hampshire state line at both Spero’s Martial Arts Academy (Plaistow) and Burgess MMA (Manchester), Pagliarulo is fully aware that he’s walking into the belly of the beast. Pagliarulo said he accepted the risk and potential reward of his NEF debut for the same reason adventurer George Leigh Mallory once rationalized his attempt to climb Mount Everest: Because it’s there. After three relatively short fights near his home base, Pagliarulo wasn’t satisfied with the potential competition close to home and had his handlers cast a wider net. MMA was a natural progression for Pagliarulo, who made his mark in the realms of both wrestling and Brazilian Jiu-Jitsu. He was captain of the wrestling team as a senior at Central Catholic High School in Lawrence, Massachusetts. Pagliarulo’s transition to Plymouth State University was an immediate success: He was 16-10 and earned the team’s rookie of the year honors as a freshman in 2016-17. All the while, he began training for the combat cage when his schedule permitted. After only four forays onto the wrestling mat as a sophomore, Pagliarulo hung up the singlet. Pagliarulo also stepped up his BJJ training. He is currently a blue belt. In his September 2017 MMA debut, Pagliarulo exploded onto the scene with a second-round stoppage of Harry Gigliotti via rear naked choke. Brimming with confidence, he received a wake-up call five months later when Matt Brady locked Pagliarulo in a guillotine choke and dealt his initial loss in under a minute. That 67-second knockout of Eddie Linscott put Pagliarulo in position for the first title fight of his career. He’ll take on a hungry opponent who encountered adversity, of sorts, in his last fight. Richard fought veteran Fred Lear for the same belt in February, with the judges declaring a rare draw. With Lear making the decision to eschew a rematch and turn pro, Pagliarulo is the beneficiary. Pagliarulo remains in school as a back-up plan. He’s a junior academically. He would gladly put off using that degree, however, if it meant a chance to travel the world and jump with both feet into the sport he loves. “UFC is definitely the end goal. Of course it is for everybody,” Pagliarulo said. The guy who shares everybody’s dream … and was looking to fight anybody … hopes a win over an old wrestling buddy will help him get recognized as somebody.